Celebrating Independence Day without arranging for some parties, sounds just so incomplete. An eventful party is sure to enhance the patriotic mood further. Browse through and find out what are the true requirements for hosting an eventful party! Once you implement these party ideas, you are sure to come up with a prosperous Independence Day party, which will be enthralling to all. So pull up your party socks and start planning for your Independence Day party. And if you find this article was of any help to you, be sure to refer this page to your near ones. The Fourth of July has always been celebrated by American citizens in the past. This year marks the 235th birthday of U.S. independence from the control of the King of England, including his taxes. This particular story has been shared numerous times by documentary, text and even news bits. But no matter, here is yet another take. This version deals with the first party who were Indians, the second party being colonists and a party crasher, King of England. When the second party began digging the new land or the land of the free as promised by the third party, King of England, the first party was over. The third party insisted that the second party should give up some of their own offerings in the process, commonly known as taxes. The second party was eventually running out of supplies. However their dignity remained intact. Now, the third party tried to remove the second party by retaliating. But the second party was free from obligation and getting down. With a little help from a few friends, some Indians and some French, the second party drove the party crashers off of the land. Ever since then, America has been on her way to becoming the high class country she is today. At present, any number of parties is most welcome in the land of the free. The bouncer of the U.S. government usually lets almost anyone in. And on the Fourth of July, also known as Independence Day in America, U.S. citizens celebrate it with a Grand National party. Happy Independence Day! Let us begin! Now why not try something fun? 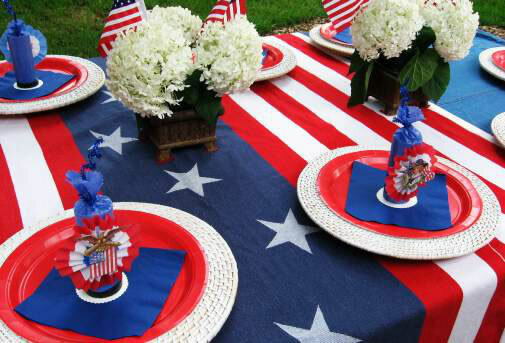 How about I give you 50 last minute patriotic July 4th ideas? Sounds interesting? Let’s begin. A brief description is included with each idea. The colors blue, red and white are a must for patriotic activities. Make sure you have the following items at hand, a few white, red and blue beach balls along with some smaller white, red and blue bouncing balls. White balls which scream the festive mood of July 4th, Independence Day, with sayings and patriotic drawings on it by children (drawn with safe blue and red markers). Some other items the kids can draw on include white, red or blue balloons, with soft child safe markers because balloons can be dangerous to the little ones. They can also draw with washable sidewalk chalk for sidewalks, a drawing pad sitting out with red and blue markers on the side or white paper tablecloth. You can place a large white sheet where it will be noticeable by the guests. Here, guests will write anything they wish to, with a big blue or red marker. After a couple of couple of people with great ideas, this ‘guest book’ will end up having all kinds of messages on it. It will become a genuine keeper of patriotic memories. Party supply stores are abundant in white, red, and blue napkins, cups, plates, knives, forks, and spoons. You may even come across a white, red, or blue punch bowl, platter or a decorative dish. Blueberries on white icing or red cherries can turn a simple cake into something patriotic. You could also go with a topper with Mount Rushmore, mini U.S. flags on toothpicks, a large U.S.A. wax candle or "Happy Fourth" written in frosting or gel. Another thing you could try is frosting a white cake with stars in view and horizontal red lines across the sides. It’s very simple, just take a toothpick to lightly draw a star(s) on the top or the face of the white cake and leave it untouched. The blue frosting will cover the rest of the top and you’ll have your U.S. flag cake. White, red and blue drinks are good too. Fruit drinks, red cranberry, white coconut drinks, cherry or even the red bottle of Mountain Dew will suffice. Blue drinks can include blueberry drinks, Hawaiian drinks, blue fruit drinks, and yes, the blue bottle of Mountain Dew. Who knew they would make Mountain Dew so patriotic? White, red and blue streamers and white, red, or blue Hawaiian type lays be used together as fireworks on Independence Day. 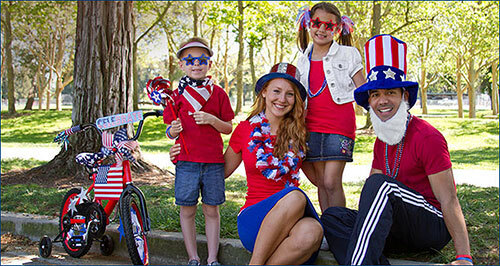 Stars, flag towels and stripes on trunk or bathing suits, small red, white, and blue bows, a beach hat with a patriotic scarf added or on flip flops are other great 4th of July ideas. Playing baseball in the water can be done with a squish ball which can be found in the pool isle where water toys are kept at department stores and a cushioned baseball bat. You can find white red and blue floats at a similar place. How about wearing white at a party event with red table items and blue balloons? But a mixture of blue, white and red, especially on yourself, is a potential hit. Wear those American colors! And don’t you businessmen forget the flag ties. Mailboxes look nice when they are dressed up. Do it for the Fourth. Place large blue, white, and red ribbons on top of your mailbox in a bow formation. A door mat with a patriotic design is also worth noting. You can place small white, blue and red ribbons on the wall lamps next to the front door. Departmental stores are full of patriotic music folks. Go ahead and grab a patriotic CD for background music. Just pick up the disc which appeals to your guests and you. A good example for this is The Patriot. It is simply 5-star entertainment. If you plan the location and the requirements appropriately watching fireworks can be a lot of fun. Make sure you carry a bag filled with blankets instead of carrying chairs around. Don’t worry; it won’t hurt to use a white colored blanket which can be bleached after the event. Make sure the blanket is not too new but bug enough and soft enough. It shouldn’t leave you crying over an accidental trip. Bring your own drinks instead of buying expensive drinks on the Fourth of July. It doesn't require too many drinks to make sure you are well hydrated during the fireworks. You'll need one or two drinks per person, maximum, for around three hours. Another interesting to try is planting white, blue and red ribbons as bows on the front grill of a car. However, never put a bow on the back grill. This is where you cook your July 4th burgers. Make sure you add hotdogs to the Fourth of July meal. Also, let's not forget the traditional Fourth of July hot dog hogging contests. How about having one of your own? There you have it. Tucked within this article are over 50 Fourth of July ideas for that last minute preparer within you. No matter what you do on July 4th, make sure you exploit the freedoms to do so. Happy Fourth of July people!